Pilotage is the pinnacle of the maritime profession. Pilots are experts on local waterways who board ships – often by climbing a Jacob’s ladder up the side of moving vessel – to make sure they dock and depart safely. The challenging voyage to land this job usually takes decades. Most are in their 40s or 50s before they’ve amassed the experience to take the test and begin training. But not Bendixen. Chasing her lifelong dream with dogged determination and laser focus made her an anomaly on several fronts. Just 36 years old, Bendixen was licensed in September 2018 as one of 52 members of Puget Sound Pilots. “That’s probably pretty close to a record,” said Sheri Tonn, chairwoman of the state Board of Pilotage Commissioners. Bendixen is also Washington state’s first licensed female pilot. Tonn estimates only 3 percent of the nation’s 1,100 pilots are women. “I’m thrilled she is the first because she is such a fantastic role model,” said Tonn, who is working to promote diversity in the industry. Bendixen spent most of her life on the water. She grew up on a charter boat her parents operated in Alaska and Puget Sound. She graduated from Maine Maritime Academy in 2005 and went to work on giant cargo ships. As her work took her to the Middle East, Antarctica and much of the rest of the world, Bendixen never lost sight of her dream. While most spend about six months per year at sea, Bendixen turbo-charged her career by spending 10-11 months per year at sea for nearly a decade. “I loved it,” she said. She earned her unlimited master’s license and spent her spare time studying for the pilot exam. While candidates must already excel at a challenging career just to take the test, passing the test is just the beginning of the final set of hurdles that eliminates even seasoned master mariners. Candidates pay thousands of dollars ($3,900 in 2018, down from $5,000 when Bendixen took the test in 2016) to take two exams — a 150-question written assessment and a test in a simulator. About 60 percent of candidates successfully pass both exams, according to Tonn said. The candidates are then ranked by their combined scores. When Puget Sound pilots retire, replacement candidates are contacted based on their ranking. Bendixen was No. 1 after taking the exams in 2016. Puget Sound pilots are well compensated, Tonn said, so it might seem like a no-brainer when they get the offer to start training. But for many, it requires leaving a fulfilling, high-paying job for a two-year training program that comes with a $6,000-per-month stipend, but no guarantees of success. “I knew the answer,” Bendixen said. “I didn’t like the answer, but for me it is something I’ve been striving for my whole life.” So, she quit her job and started training in May 2017. Like the rest of her career, she found success faster than most. Training consists of about 300 trips, said Jaimie Bever, executive director of the Washington Board of Pilotage Commissioners. The candidates observe for the first 100. They’re trained for the next 100 and take over as pilot for the final 100. Should the evaluating pilot need to intervene more than three times, trainees are eliminated from the program. Candidates have three years to complete the training and prove their skills in other ways, like replicating from memory all 26 nautical charts of Puget Sound. And as if all that wasn’t challenging enough, Bendixen got married during the final months of training. 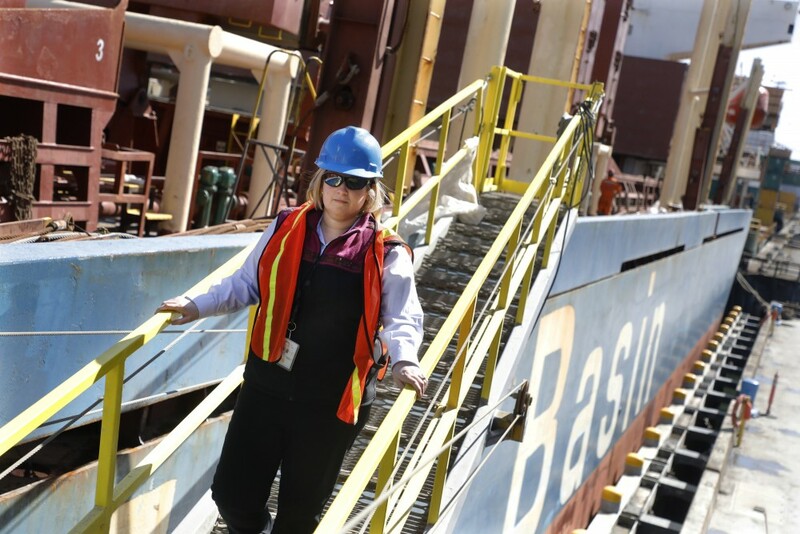 Her husband Mike Mancini works on TOTE Maritime ships. Bendixen completed her pilot training in just under 16 months. She was prouder of finishing than becoming Washington’s first licensed female pilot. “That doesn’t mean anything to me,” she said. “I don’t really put gender to it. I’m a pilot. It’s me that made it, not my gender. It was my hard work, my skill, my dedication and determination — not a gender that I have no control over.